About a year ago, I wrote a piece reflecting on the variable preparation and response to devastating earthquakes in Chile and Haiti. This year, the recent Japanese earthquake begs comparison. At 9.0 Mw, last week’s quake is the largest recorded Japanese history and one of the top 5 in world history. Obviously any amount of preparedness could not stop all structural damage, but much damage was avoided especially in cities farther from the epicenter. 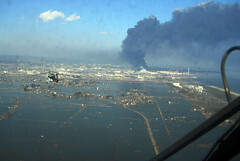 The real damage in this case was from the tsunami, which caused much of the damage to the city of Sendai as well as the nuclear plant people are so worried about. While money-wise the Japanese quake caused much more damage, this is mostly due to the the fact that Japan is one of the world’s largest economies, and, obviously, productivity has gone down. However, Japan’s strict building codes and the unity of the Japanese people have helped greatly in both minimizing the damage and organizing the rescue effort. While every news update holds new information about rebuilding, imminent nuclear danger, and the rising death toll, it is important to realize that building codes and preparedness do significantly help even in the case of very strong quakes. While the trains in Japan may not be running on time, most places outside of the immediate area near the epicenter have power and have regained many of their former amenities. Tsunamis, of course, are a whole different issue, but, nonetheless, the damage to the structures and to the population in Japan is far less, even in the most affected area, than that inflicted by the lower magnitude quake in Haiti last year. While it’s early to rack up statistics while the rescue effort continues, it’s at least clear that the precautions taken by the Japanese to construct quake-resistant buildings and fallbacks does have certain merits despite the devastation left in the wake of any large scale natural disaster.